Photospector isn’t flashy. It doesn’t have fancy filters that make gorgeous images, like Glaze. It doesn’t provide any features not already found in other apps. It simply provides the basic features you need everyday that work well together, on single or multiple images, with a much more intuitive and powerful interface than any other app. The basic stuff done right. Instead of reducing the resolution of your images like the default Photos app, Photospector works with full resolution images with all their gorgeous detail. Instead of software-based color correction that takes a second or two per image, Photospector provides real-time GPU-based professional color correction tools including color curves and vibrance — working at full-resolution. 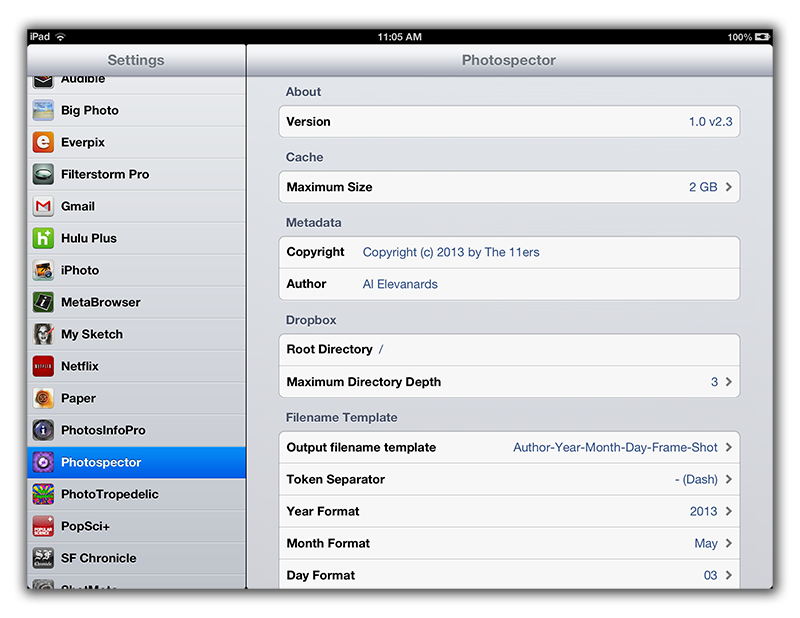 Instead of clunky folders, Photospector lets you search your image collection by keywords, metadata, star ratings and dates. And, instead of simple sharing, Photospector provides an advanced sharing interface with controls for selecting the destination album, resizing the image, renaming images and managing metadata. You can share single or multiple images, even entire albums and search queries. 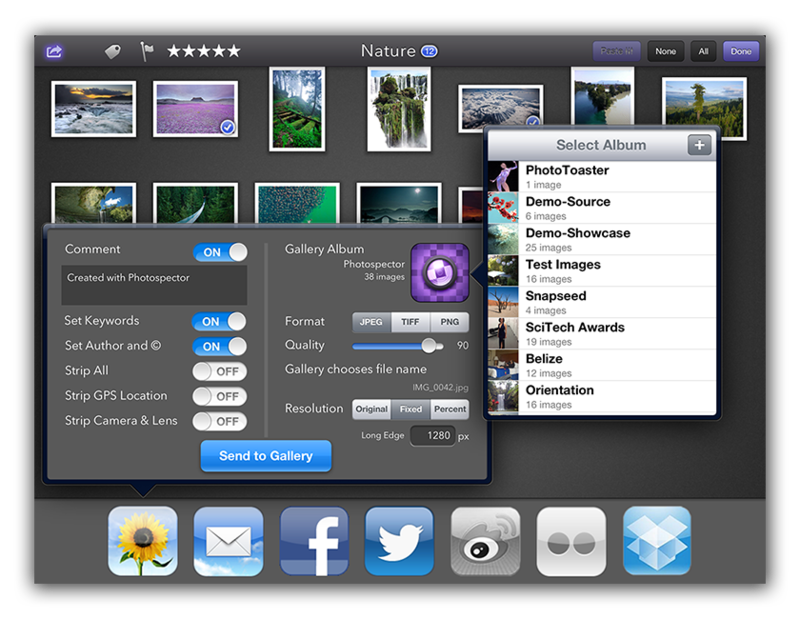 The album selection button opens the album navigator so you can choose a destination album. You might expect this when saving to the iPad gallery, but this also works for Facebook and Dropbox, allowing you to better manage your remote photo storage. The metadata controls allow you to strip all or various portions of the “extra” data that is automatically stored inside your image by digital cameras. You can strip off all the metadata, or decide to just remove the location or camera information. You can also add comments, your name and copyright stamp, and any modified keywords you may have set using the keyword controls in Photospector. It will also save out your star ratings which can then be read in by any standard app, like Lightroom, and used to help sort your images. The file format controls allow you to resize the image either by specifying the number of pixels in the long edge. The dialog is designed to be used when you are sharing multiple images, and specifying the long edge allows this resizing operation to work for images with different aspect ratios. You can also specify to save at the original source resolution, or as a percentage of the original resolution. You can resize the images both smaller or larger than the originals and high-quality resampling algorithms are used to produce a final image. You can change the file format and control the compression quality (for JPEG), which is very useful if you want to avoid introducing compression artifacts while processing your photos. The Photospector settings, available inside the standard Settings app on the iPad, allow you to set your preferences — things that you don’t need to set each time you share images. You can set your Copyright and Author settings at the top and use these to stamp your name on your photos. With group selection and sharing, this provides a simple way to tag your images before sharing them publicly, retaining your copyright over the photos. You can also set the filename template used when saving out images, along with various options to control the details of each component in the name. For example, the default format will name files using your Author name, the date & frame number, and the shot name, which is an optional field specified in the sharing popover within Photospector. This provides you with the ability to change a portion of the name each time you save out a set of images, without needing to switch to the settings app each time. You can use four-number or two-numbered years, numeric or text (e.g. “Mon”) for day of the week, and dashes, underscores, spaces or no separators between each token. An example of the final filename is shown and updated dynamically as you change the format and shot name so you know exactly how it will look on Dropbox. A default set of name templates and formatting options are provided to give you a fair bit of flexibility and personal preference for the names of your shared files. We don’t currently provide the ability to specify your own templates, mostly for simplicity and to avoid complex parsing errors, but hopefully the defaults provided cover almost every possibility. Let us know if we’re missing your favorite! Of course you cannot select output filenames when saving to the iPad gallery — those names are chosen by iOS and you cannot change them. iOS tries very hard to eliminate the notion of a file entirely. And yet, it only provides basic folder-based management in this age of search. Photospector’s search albums provide a way to organize photos semantically using keywords and the data you already have in the photo metadata — location, dates, keywords, ratings and camera information. Search is much more powerful than folders, especially when managing large libraries. Asking for all of the “4+ star rated photos from Belize” is much nicer than searching through thousands of thumbnails! And yet, files are pervasive. They are used everywhere outside of the walled iOS garden. 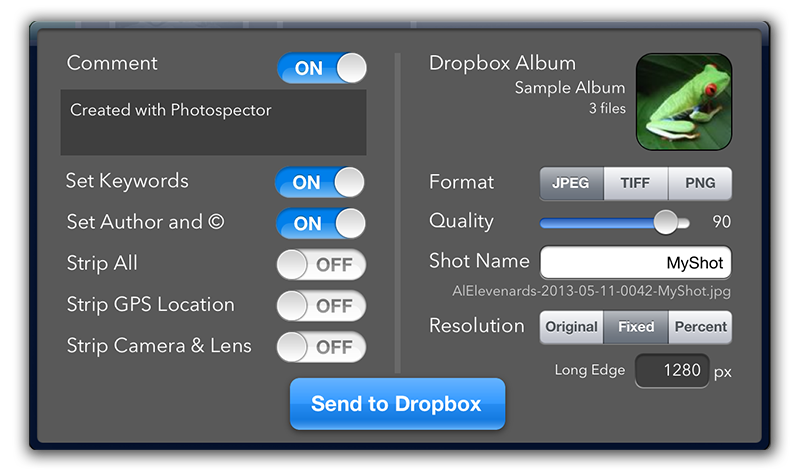 Photospector’s file naming tools, like all of Photospector’s features, are designed to play well with others — to bridge the gap between the file-less world of iOS and the file-centric world of Dropbox, your desktop, your website and other cloud storage. Allowing you to upload and rename files using standard tools to carries Photospector’s semantic search results to wherever you need them to do your work. You will often find individual apps on the iTunes store that handle the features we’ve just covered. Some apps just do resizing, some simply strip the metadata, and others let you view full-resolution photos. But we’re not aware of any single app that provides all these controls, and many more, that can be applied to single or groups of images, in a single package elegantly designed to fit your workflow. We feel this is the set of features we need whenever we save out photos, and we missed not having these controls in any other app. That’s what motivated us to build Photospector — we just wanted what we considered to be basic, functional features for professional image management presented through an intuitive and highly functional interface. We’re very excited that Photospector just entered Beta testing and can’t wait until it is available for public use on iTunes! This article was posted on Sunday, May 26th, 2013 at 4:04 pm	and is filed under Uncategorized. Both comments and pings are currently closed. 1 Response to "Advanced Sharing"
This looks like a winner.